Randomly picked from an old cooking magazine this turned out to be the perfect mid week supper. At the same time, it’s so tasty I think we’ll definitely be dragging it out for summer BBQs. This time it’s Australian Gourmet Traveller, December 2009 and the “Gourmet Fast” section provides our dinner. I skipped over the fried quails and headed to the lime and chilli steak fajitas. This meal is just ridiculously easy. It’s in three components, so you can mix and match and it’s structured perfectly so you can do it all with a minimum of fuss. There’s also not a big list of hard to procure ingredients – everything you need you probably have in the fridge or can buy easily from your local shops. The first part is the steak. The recipe used skirt, I used rump. Take your steak and squeeze over the juice of a couple of limes (I actually had half a lemon hanging around so I used that and one lime). Ensure you cover both sides and then leave to marinate while you put together the two salads. Turn the steak at least once while it’s marinating. The salads are really two basic salsas: avocado and tomato. For the avocado, peel and coarsely chop one avocado. Mix it with some lime juice, some finely chopped red chilli and some extra virgin olive oil. For the tomato, coarsely chop a tomato and mix it with some chopped coriander, some lime juice and some extra virgin olive oil. Andy decided we definitely needed onion in our tomato salsa so I added about a quarter of a finely chopped onion. Heat a griddle pan (or the BBQ) and cook the steak according to personal preference. When the steak is cooked allow it to rest for 10 minutes or so (pop it on a plate and cover it in tin foil) and then slice finely. You’re all done! 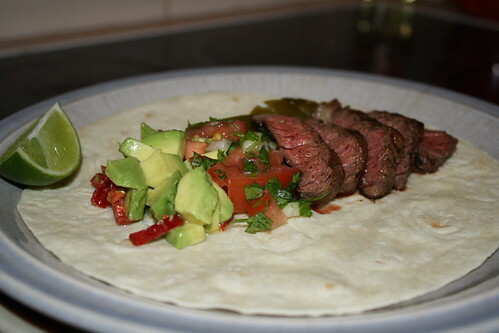 Assemble the fajitas by grabbing some tortillas and adding what you will. We included some jalapeños. Some finely sliced iceberg lettuce or a dab of sour cream would also work well. My tip for this recipe: don’t be tempted to substitute lemon for ALL the lime juice. For the salads in particular you definitely need lime juice and you should ensure that you have at least some lime juice in the marinade.